Travel by luxury van through wine country's gorgeous vineyard-covered hills, on this day-trip to Napa and Sonoma from San Francisco. You'll visit at least two top wineries, dine at a gourmet Sonoma restaurant, and toast to the end of your journey with some sparkling wine. Learn all about Napa's famous wine culture on this scenic, small-group tour which includes round-trip transport from San Francisco. With an intimate party size limited to 13 passengers, this is an unforgettable journey into wine country you won't want to miss. 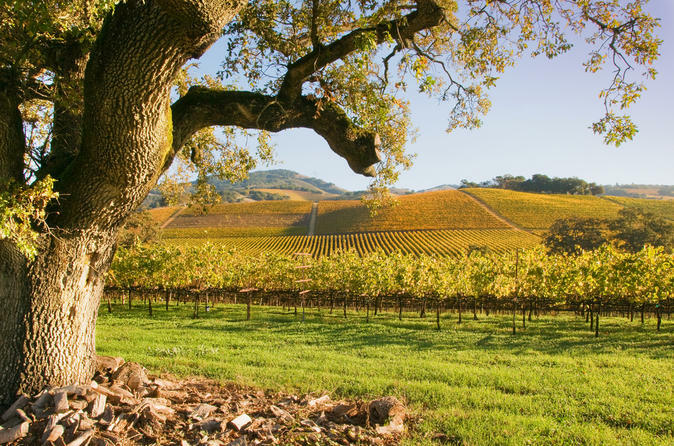 After pickup from your San Francisco hotel, relax on the 1-hour ride north to beautiful Sonoma Valley. Aboard a luxury van, your experienced guide will show you the best of California wine country during your day trip. You'll visit at least two of Sonoma Valley's top wineries and sample vintage wine in their tasting rooms. Learn all about the art of wine making as you sip a variety of fine wines and mingle with your small group. At midday, enjoy a leisurely lunch at the Plaza Bistro, a gourmet restaurant in Sonoma, before continuing to Napa Valley. A scenic ride to Domaine Chandon will offer stunning views of vineyard-studded hills. When you arrive, toast with a glass of bubbly at a specially reserved table and savor the last of your wine country tour. Wineries you may visit include Viansa Winery, Cline Cellars, Larson Family Winery, Homewood Winery and Jacuzzi Family Vineyards. At the end of the day, sit back and relax on the ride back to San Francisco. Please see the Itinerary section below for a sample lunch menu.